The technology of dyeing textiles in a rich purple colour derived from marine molluscs is remarkably ancient. 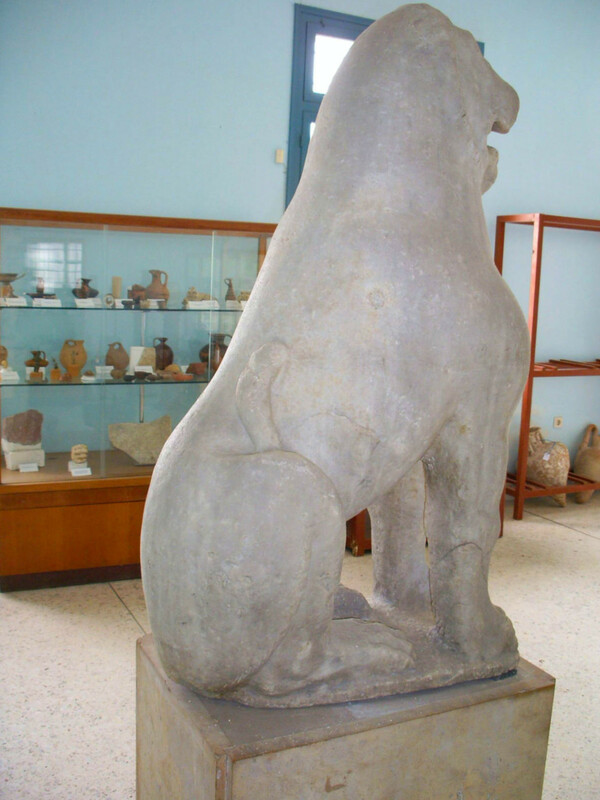 It has always been supposed that it was first mastered by the Phoenicians or the Minoans around 1600 bc; but there is archaeological evidence which suggests that is was possibly developed a century or so earlier in the Persian Gulf, and perhaps subsequently brought into the Mediterranean by the Phoenicians. The origin of the dye is in a colour less fluid in the hyperbranchial gland of the Murex brandaris and Murex trunculus molluscs: this fluid is actually the precursor of the dye, and when exposed to the atmosphere it converts rapidly to the purple pigment. The technical difficulty lies in the fact that, once it becomes a pigment it is no longer soluble, and in order properly to dye a fabric the colouring matter must be in solution. The chemical technology involved in circumventing this problem, which involved fermentation at high temperature, has al ways been a well-kept secret: even Pliny the Elder, in the 1st century ad, was unable fully to obtain the necessary information for his encyclopaedic Natural History. With the fall of Constantinople in 1453, the purple-dyeing industry was so effectively destroyed that the art of the dyers was lost, and it was only by chance rediscovered again in the late 17th century. 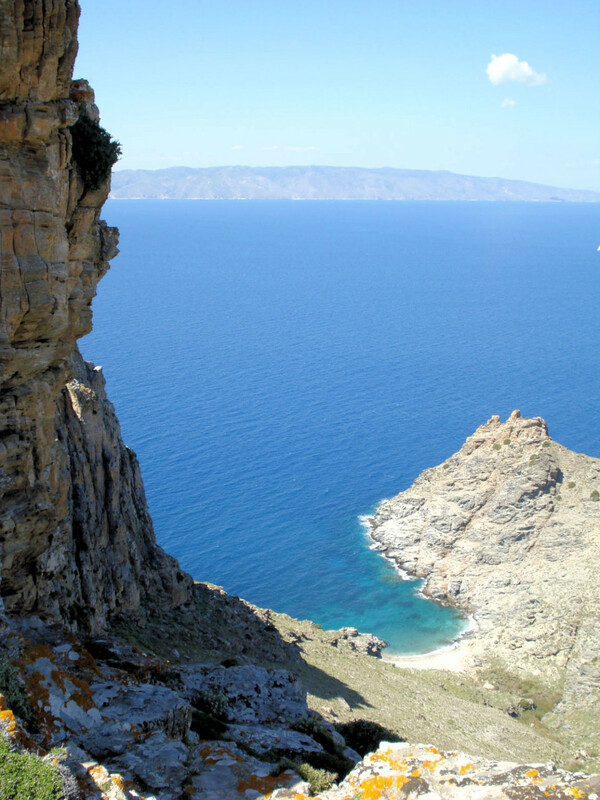 The waters around Kythera and in the gulf of Laconia are rich in the murex mollusc which is required in notably large quantities for the process. 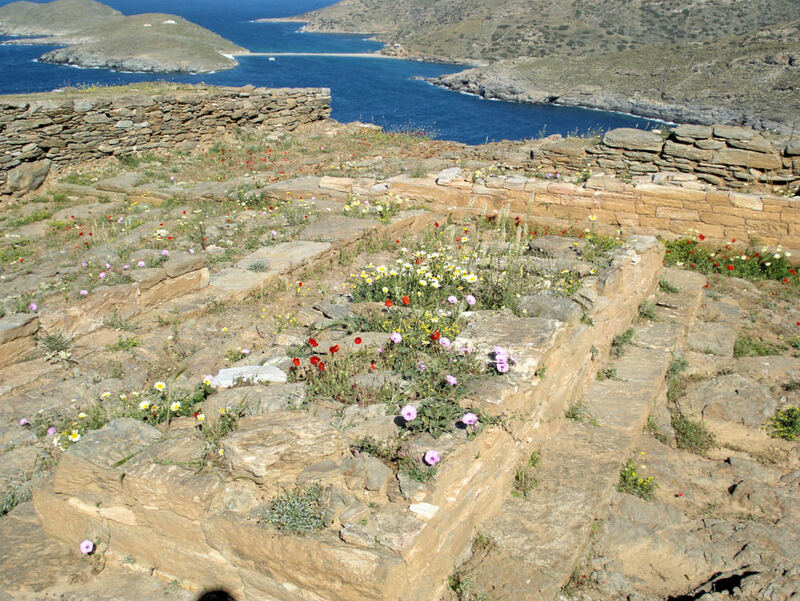 It was for this reason that the Phoenician or Minoan settlers of the 2nd millennium bc in the bay of Palaiopolis may have established their dyeing commerce in the area. To this day it is still possible to find murex shells amongst the potsherds along the shore. 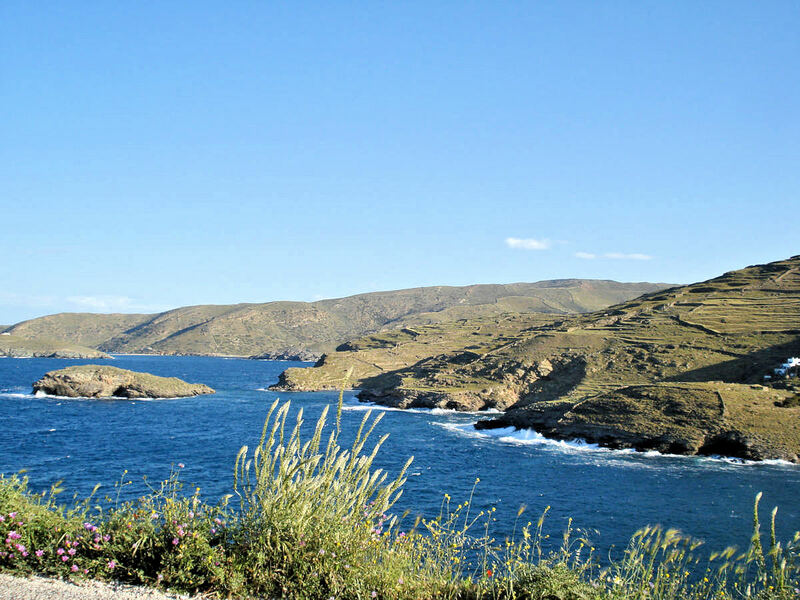 The coast road leads back, west from Avlemonas, to Palaiopolis. This name refers to an extensive coastal area which includes, amongst other things, the site of the ancient city of Skandeia, whose exact location has not been determined. 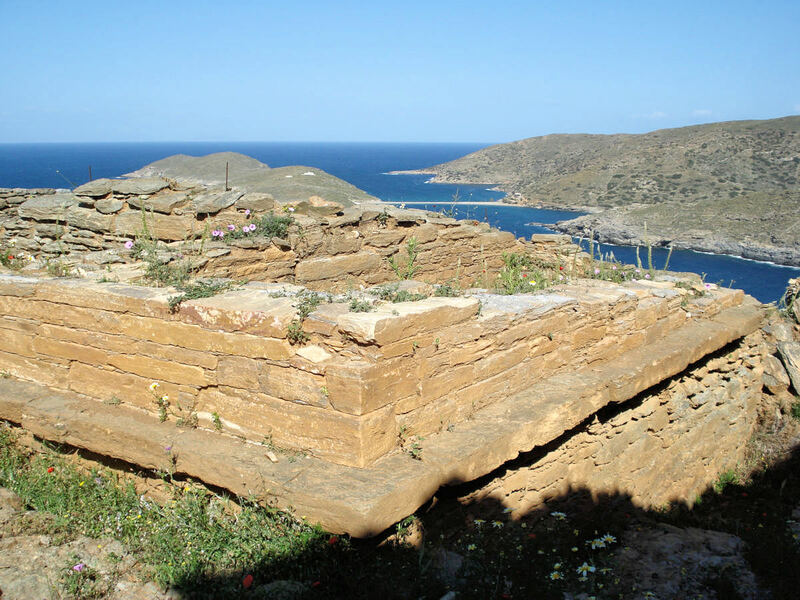 The long, wide sweep of its bay is interrupted to the southwest by a headland called ‘Kastri­’, where numerous excavations have taken place. 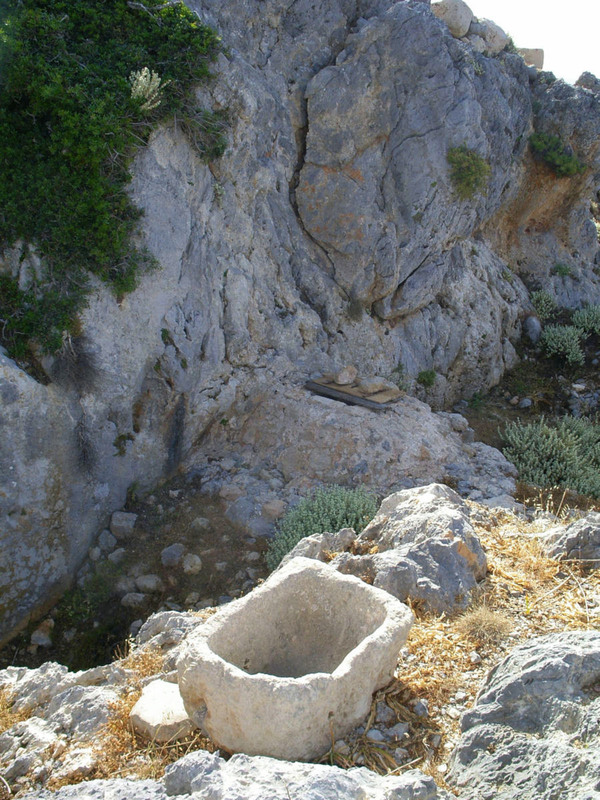 The extreme southwest corner of this headland has small caves which show signs of adaptation for the purpose of cult and of burial in ancient times. But it is in the area to the south of this point, and as far as the next promontory of ‘Kastraki’, that the presence of Skandeia is most evident. Beyond the river-bed that flows into the beach, the density of potsherds in the back wall of the bay is evidence of substantial settlement here in Antiquity: pieces of vase, tiles, and murex shells can still be found on a cursory inspection. Ancient amphorae and pithoi were once so plentiful here that many of the traditional baking ovens of the houses in this area were lined with them. 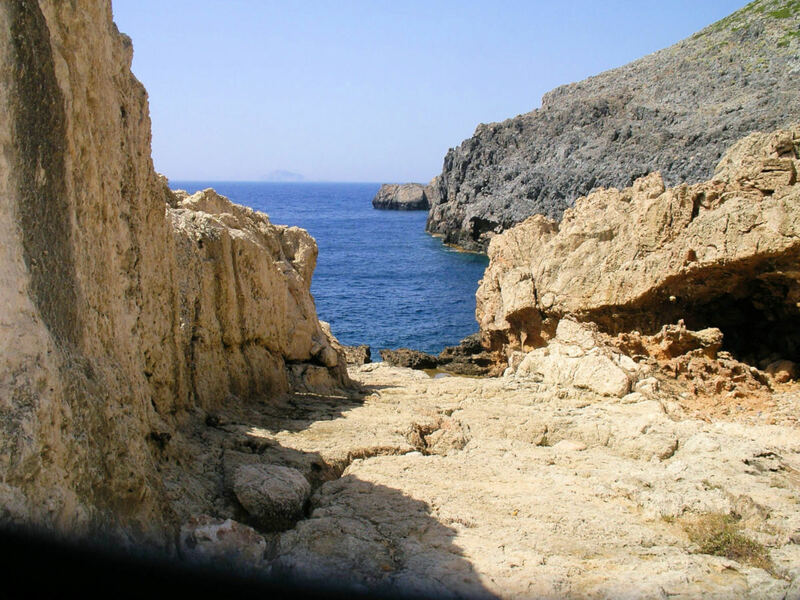 In the rocks at the south end of the bay, below the headland of Kastraki, are a number of man-made, deep holes used for lodging and fixing wooden capstans to which boats could be tied: there are several more on the top of the promontory. The material evidence points to this area having been continually inhabited from the beginning of the 2nd millennium bc right through to Byzantine times. Just west of Palaiopolis the asphalt road divides and, 200m down the left-hand fork, an unmade road leads off to the left through olive groves towards the sea. Shortly after passing the church of Aghios Minas, the track ends (1.5km), and steps lead down to the beautiful and protected beach of Kaladi­. 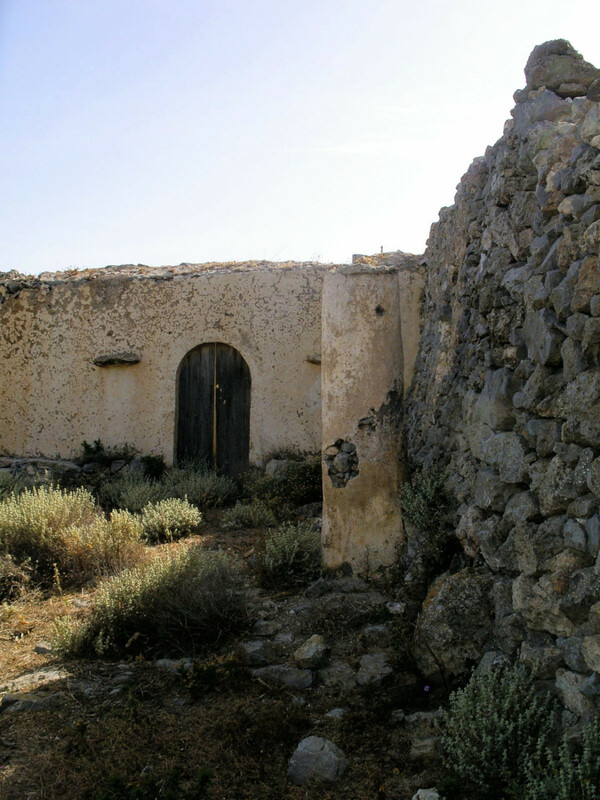 The track ends after 400m in a flat area just below a small deserted stone house. On the ground here is an ancient carved stone basin and well. Beneath the dense undergrowth all around are the collapsed walls and numerous terraces of an area which was densely inhabited in Antiquity, probably the acropolis of the ancient city. 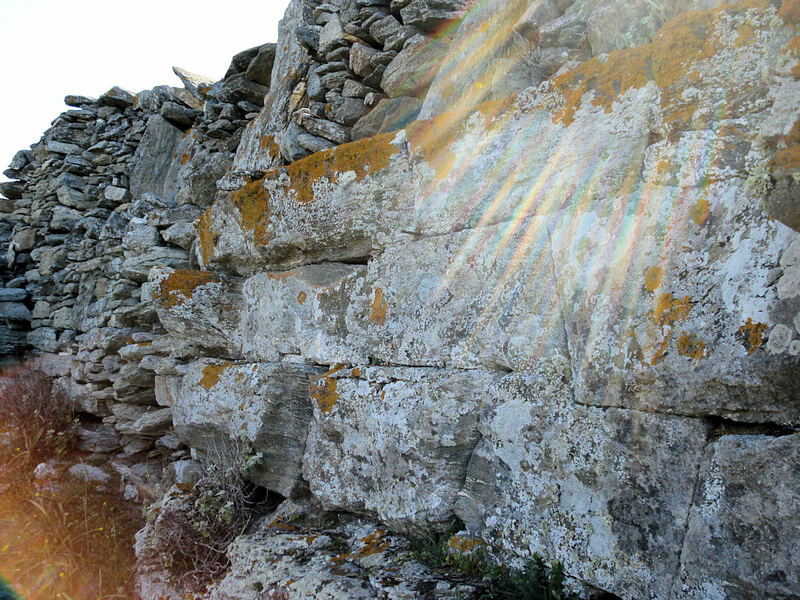 Some recent archaeologists (Coldstream & Huxley, 1973) have suggested that the temple of Aphrodite was located ‘on a terrace mid-way between Aghios Kosmas and the chapel of Aghios Giorgios at the summit of the mountain’. This is just above where you are now standing. Aghios Kosmas is clearly visible from here, and is best approached by continuing on the level towards the east and striking uphill to the church at the very last moment. This is a tiny abandoned isolated and cramped church with no external embellishment or grace whatsoever; but few churches in all of Greece give more poignant expression to the period of turmoil after the collapse of the Graeco-Ro man world, when pagan temples were unheedingly pulled down and their elements used in new buildings to the new Deity. 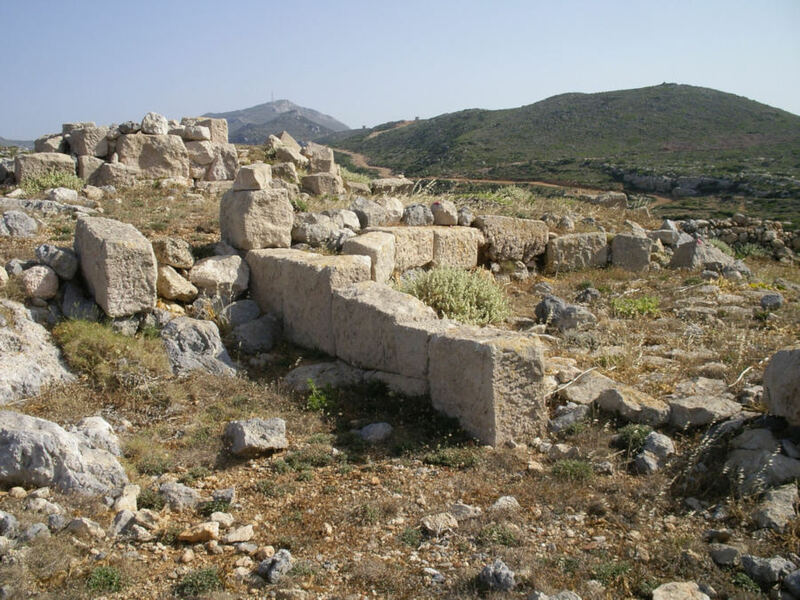 The crude exterior of Aghios Kosmas consists mostly of uniform rectangular blocks taken from ancient buildings, with some few truncated columns also incorporated, and supplemented with rough stone filling. Inside, it is dark and has the feel of a prehistoric cave. The *interior structure of the church dates in all probability from the 6th century ad—although it has been reinforced, retouched and redecorated many times since then. The narthex appears also to have been added at a later date. It is divided (almost as an ancient temple might be) into three successive zones, and the tiny interior space is dominated by the four supporting Doric columns and the disproportionate blocks of ancient masonry on all sides. Schliemann found that two of these columns had not been moved from their original position, and concluded that the church had therefore been built directly over a pagan temple. A couple of the capitals are well preserved, and these, together with the fact that the columns are monolithic, would suggest an early (Archaic) date for the temple to which they belonged. 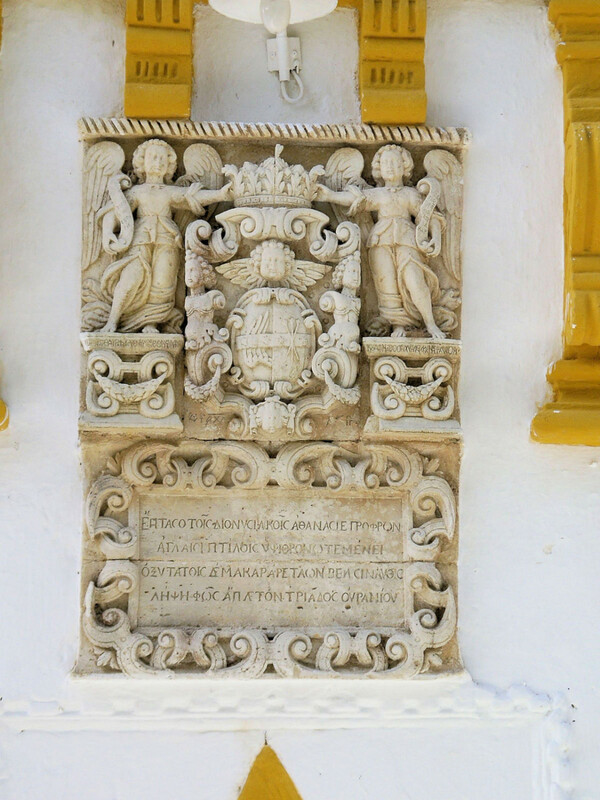 The lintel block over the passage between the narthex-area and the central part of the church is a re-used and inverted piece of ancient architrave: on its inside (east) face, the decorative dentils are still visible. Both long walls and the area above and between the two apses have the very eroded remains of paintings, but with their colours still quite fresh in places. 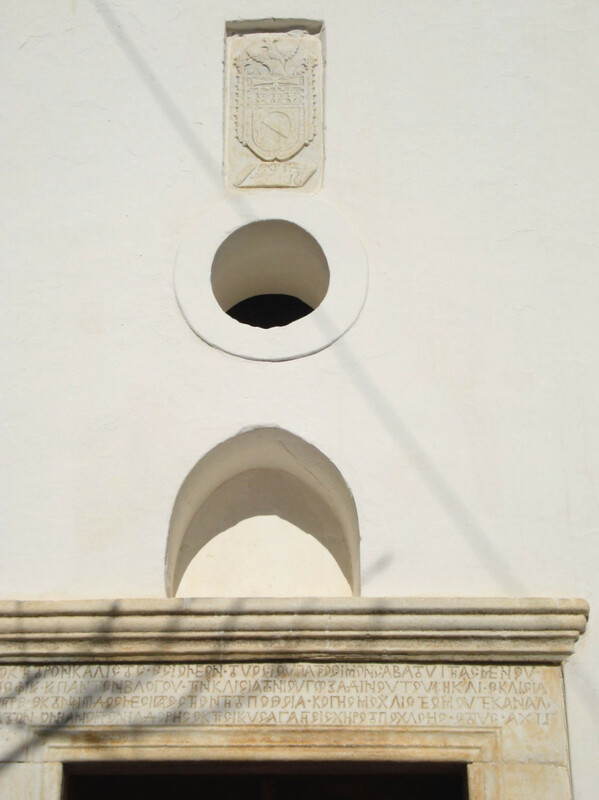 A design with two (as opposed to one or three) apses side by side at the east end is not particularly usual, and in this church it may reflect the dedication to the two Anargyri, or ‘money-less’ saints— SS. Cosmas and Damian, who travelled in Syria and in Asia Minor offering their medical services gratis. This particular dedication may also be reflected in the presence of a long low stone ‘bench’ along the inside walls of the church: part of the early cult of these two saints involved the practice— adopted from pagan forebears—of ‘incubation’, in which the sick would sleep in the church hoping for a dream in which the saints would visit them to cure them of their infirmity. Generally in the early-Christian world, where there was previously a temple dedicated to the Dioscouri—the divine twins and ‘saviours’ of Antiquity, Castor and Polydeuces (Pollux)—we find a church honouring their Christian counterparts as twins and saviours, Cosmas and Damian. 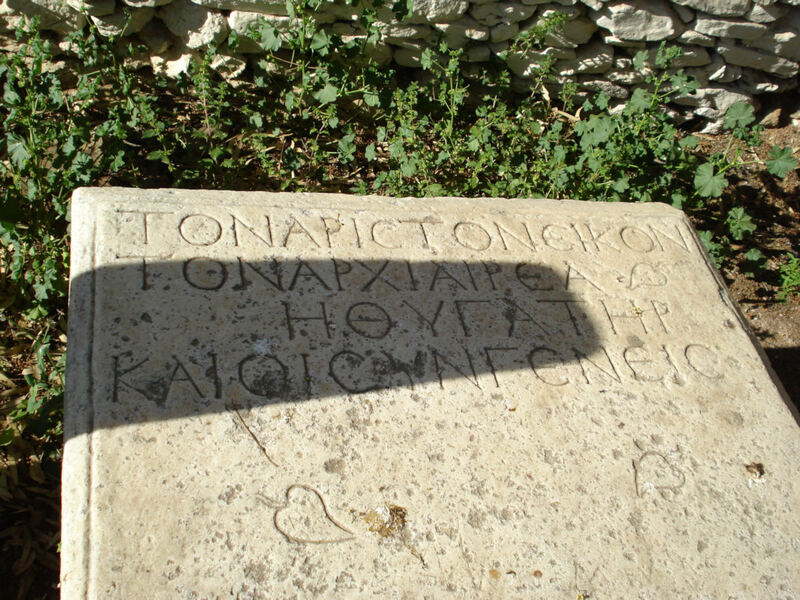 Until the site is explored in greater detail, it is not possible to say whether this remarkable church marks the spot of a temple to the Dioscouri or is built on the site of the temple of Aphrodite—or whether the antique elements in it come from one, or both, or neither of these possible temples. 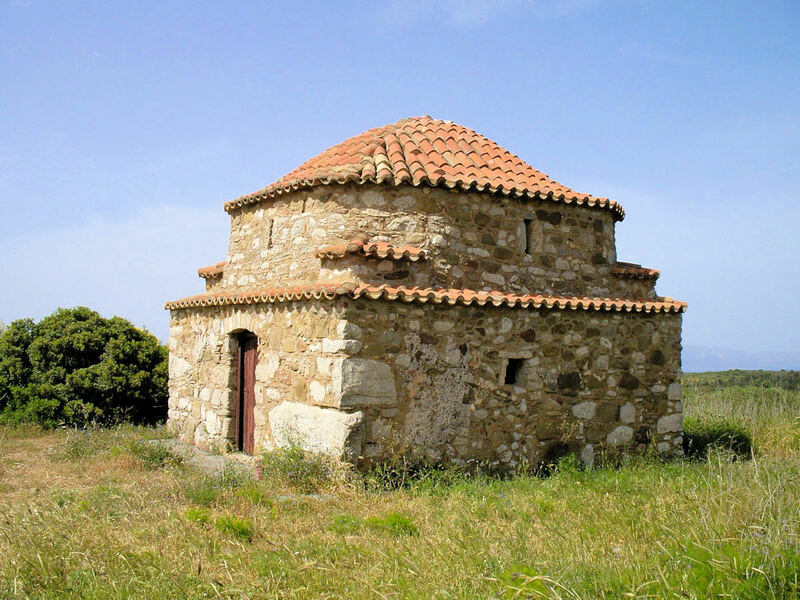 At the summit of the hill of Palaiokastro is the church of Aghios Giorgios. (There is no clear path and a visit is only for those with stamina and determination.) This is a much later, single-aisled church of the 15th century, and is therefore not comparable with Aghios Kosmas below. 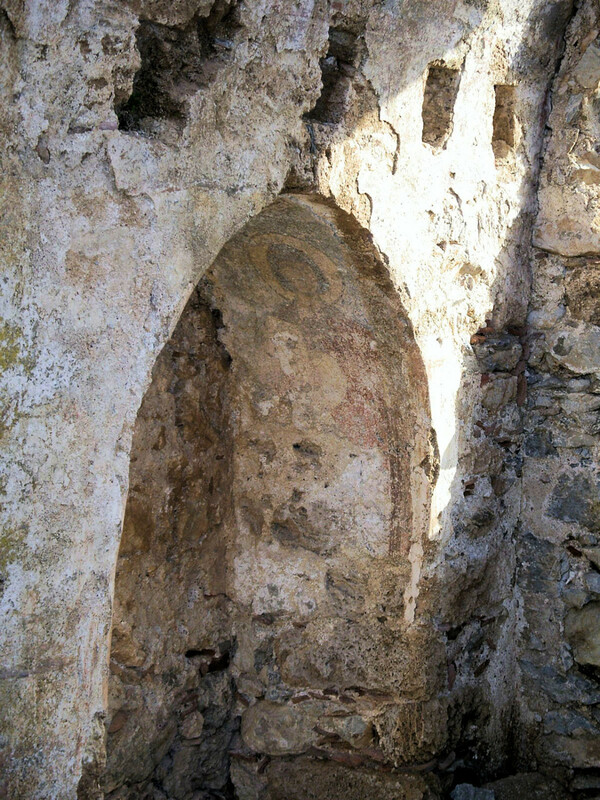 The whitewash of the interior of the church has flaked away to reveal only small traces of wall-painting in the conch of the apse, depicting the Virgin. 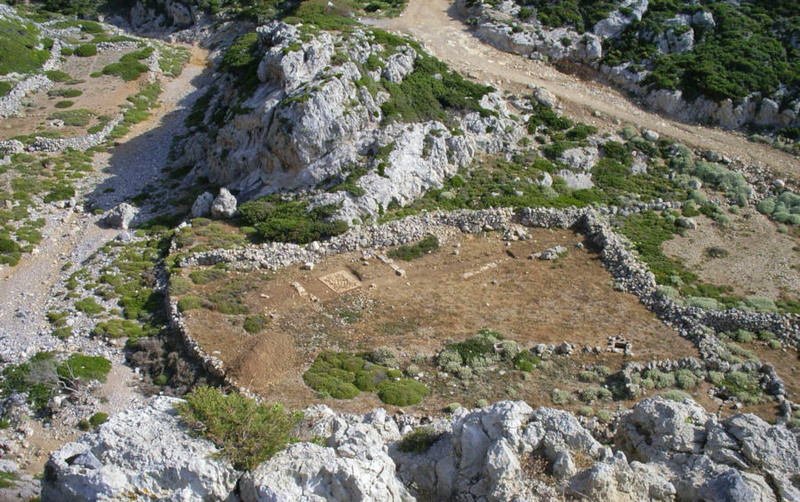 On the plateau to the west of the church, however, the foundations of a sanctuary to a female deity have been identified, and finds on the site indicate that it was frequented continuously from the 8th century bc through until Hellenistic times. The views which the site commands are magnificent and worthy of any great, Ancient Greek acropolis. 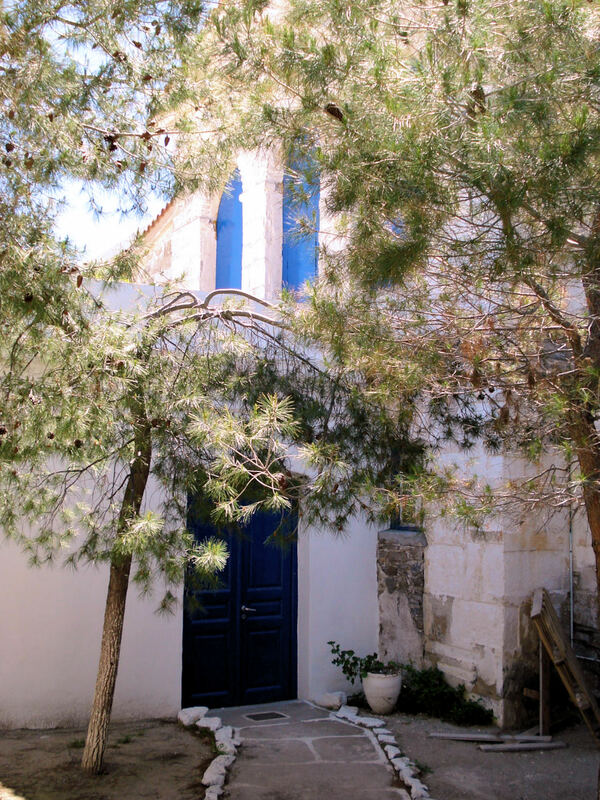 Regaining the asphalt road and continuing towards Fratsia, you pass the church of Aghios Nikolaos—unadorned, but constructed in fine stone-work—which stands to the left (south) of the road after 1km. A further 2km beyond, on the hillside and summit to the right (north), the quantity of walling and ruined stonework would suggest fairly dense habitation here in mediaeval or earlier times. The road finally reaches a plateau and then comes to Fratsia after a further 2.2km. At this point, two itineraries are possible: the first, a loop to the north; the second to the south and returning to Chora. A right turn in Fratsia leads north towards the village of Viaradika. 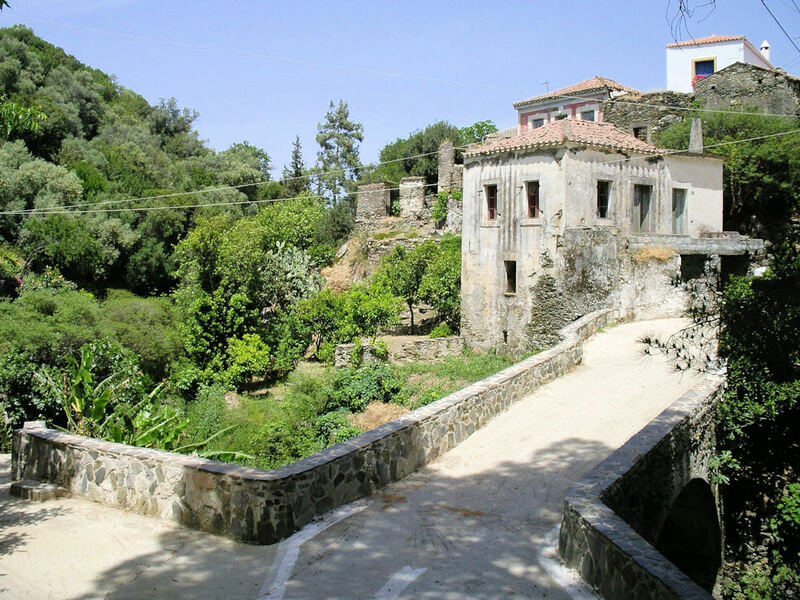 Immediately on entering this village, a road to the left is signposted to ‘Vrissi Aghiannis’: this leads through the village and ends at a point where there are plentiful springs of a soft water. Close to the spring is the tiny chapel of the Metamorphosis: the whitewash in the interior has flaked away to reveal fragments of 13th century painting of considerable quality, with somebeauti fully realised faces and details just visible. 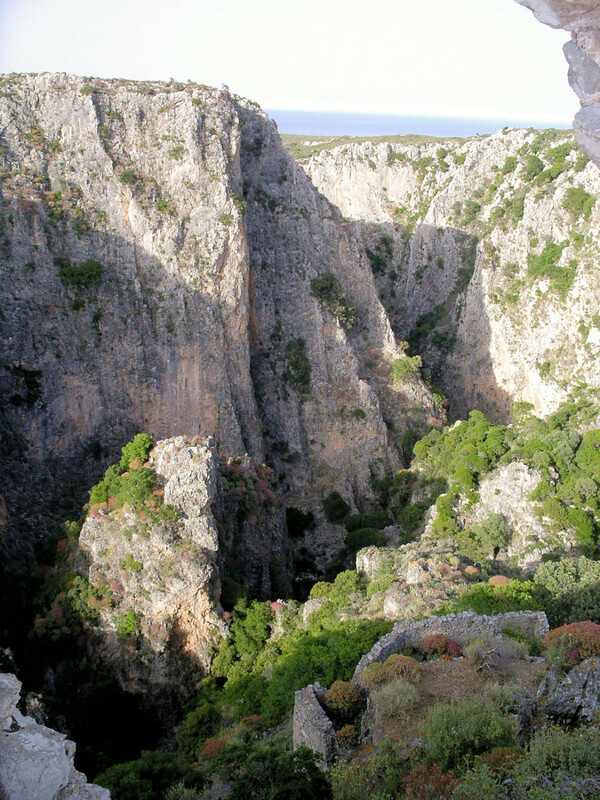 A path continues beyond into a limestone gorge, whose walls are perforated with natural caves and man-made hermitages: the area has a striking geographical similarity to the gorge and Bronze Age site of Pantalica in Sicily. After Viaradika the road descends steeply and then, as it climbs up again towards Mitata, the cliff-side of the gorge comes into view, with the cave hermitages and the remains of their retaining walls still standing, visible in the rock-face. 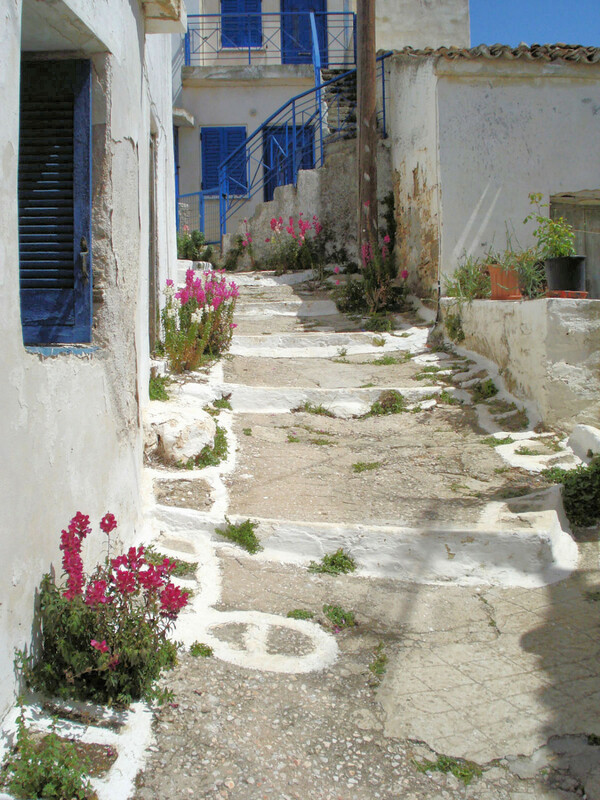 Mitata is a quiet, rambling village with several fine houses in the island’s simple and dignified vernacular architecture. 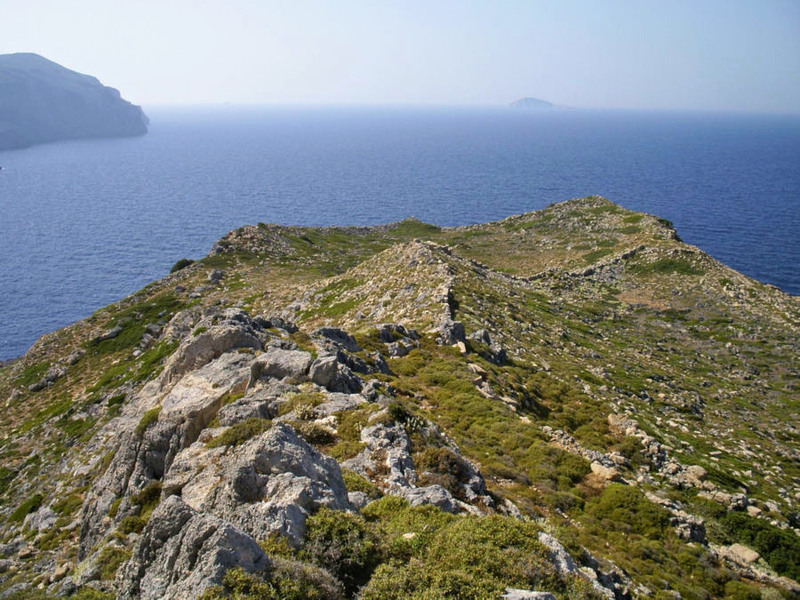 This is also a good place to find Kythera’s famed honey. From the plateia by the church of the Taxiarch Michai―l, are wide views over the plateau and hills to Aghios Giorgios sto Vouno, and beyond. 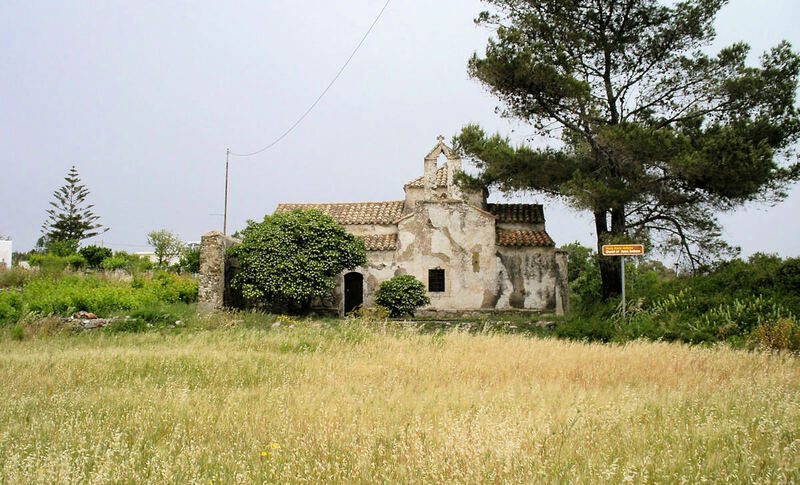 In the area of Frilingianika, to the north of Mitata, are two pairs of contiguous twin churches, both with fine paintings and both dating from the 12th and 13th centuries: together they make an interesting comparison because of the different styles of the painters working in them. First, the church of the Aghii Anargyri, on the main road. (A little over 2km north of Mitata, the road comes to a junction with the main airport road, close to the village of Frilingianika. Turning right at this point, the church is immediately on your right, at the exit from the village.) There are two parallel churches here—contiguous and intercommunicating, joined by a transverse vaulted narthex—both of which contain extensive fragments of 13th century wall paintings. The interest here is mostly in the appreciable individuality of one of the painters, whose style is best seen in the Ascension scene which covers the barrel vault before the apse in the south church: his is not an especially sophisticated style but he has imparted to the simplified and elongated lineaments of the faces of the saints a memorable clarity and char acter peculiarly his own. Their exophthalmic gazes are, at the same time, both distant and intense. This style is quite distinct from those found in the next pair of twin churches. 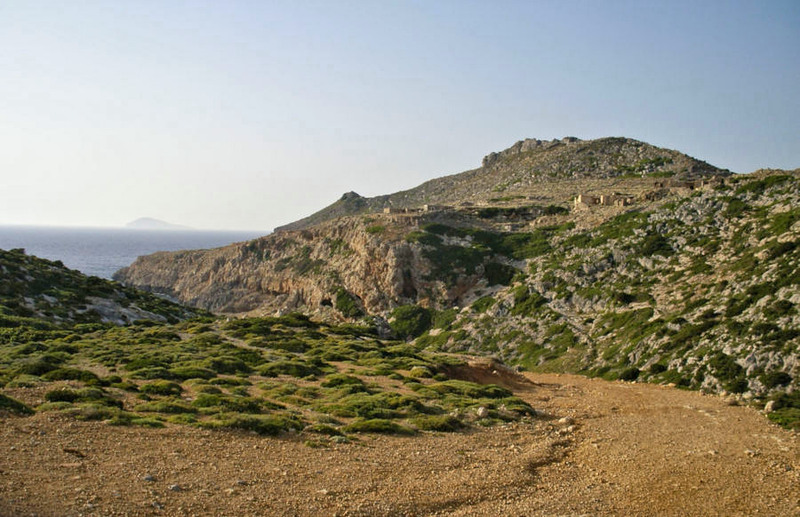 (Two kilometres further on towards the airport, a signed track to ‘Aghios Vlasios’ to the left (north), leads 1.5km across the top of the treeless plateau to the church es.) 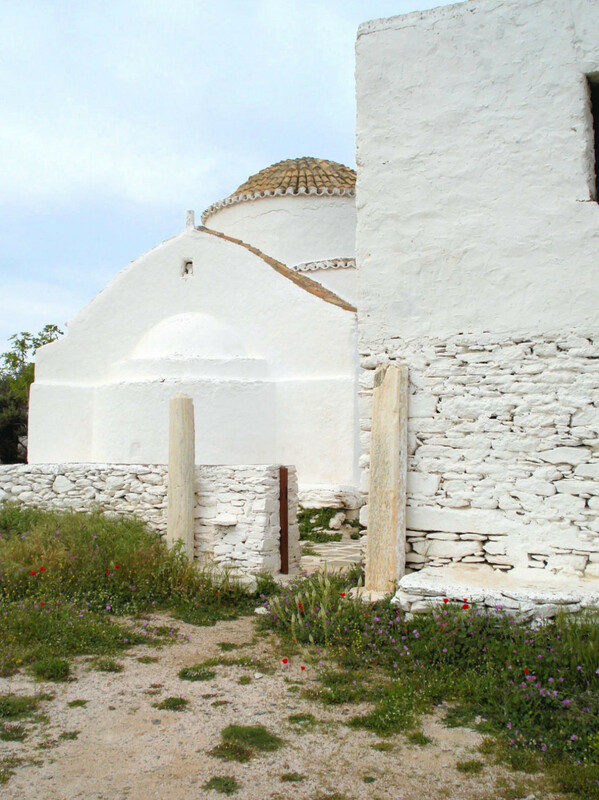 Again these are two contiguous and communicating churches—Aghios Vlasios (north; 12th century) and the church of the Panaghia (south; late 13th century)— which lie in a largely deserted area known as Pente Pigadia, just west of the airport. 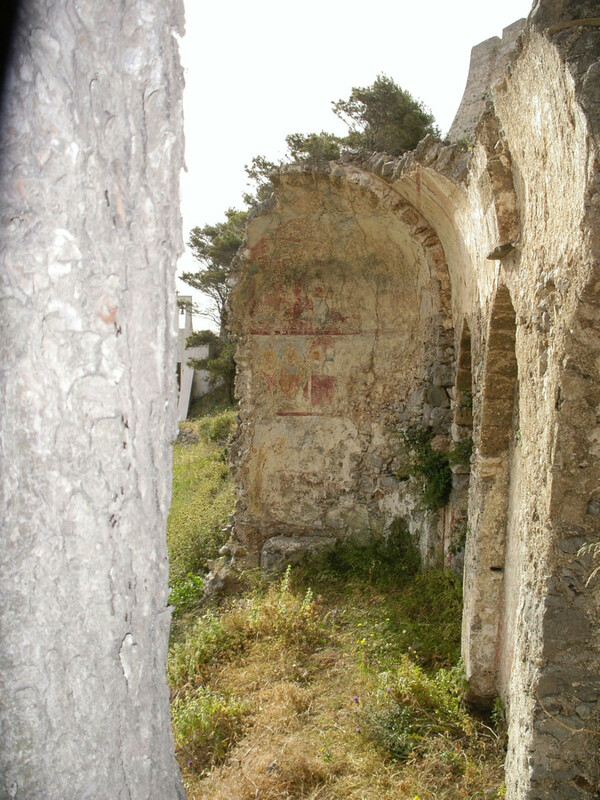 It would seem that the north church of Aghios Vlasios and its paintings are the earlier, from the fact that the wall-painting of St Irene on the south wall was destroyed when the arch was opened to communicate with the south church. Both churches are barrel-vaulted and single-aisled, both have an identical configuration of double apses, and both are decorated extensively with wall paintings. Here the faces have a wholly different character: St Blaise himself, and St Niketas in the two apses, or the full-length figures of St Mamas (with lamb) and St Theodore (mounted), above and to the right as you enter, have a greater uniformity and roundness of face than those of the ‘Anargyri painter’, but they are nonetheless quite individual in style. The paintings in the south church, executed around a century later, are again very different—heavier, more formal, richer in pigment and altogether more metropolitan in feel. The artist who painted the richly ornamented throne of the Panaghia, or Virgin, in the apse, or the figures of SS. Stephen, Myron and Basil just to the left of it, does not share the freshness of the earlier painters. His style has a more official kind of solemnity to it. 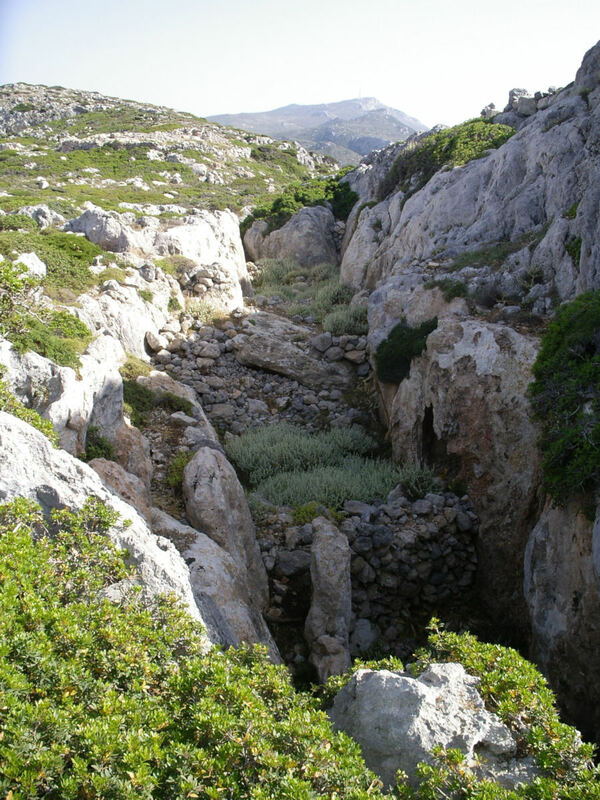 Returning to Frilingianika and taking the left (east) turn towards Mitata once again, the right-hand fork, shortly after this leads to Aghios Ioannis and the Spilia Mavra or ‘Black Caves’ (signposted). Aghios Ioannis is a superficial grotto that has been turned into a church with marble screen. 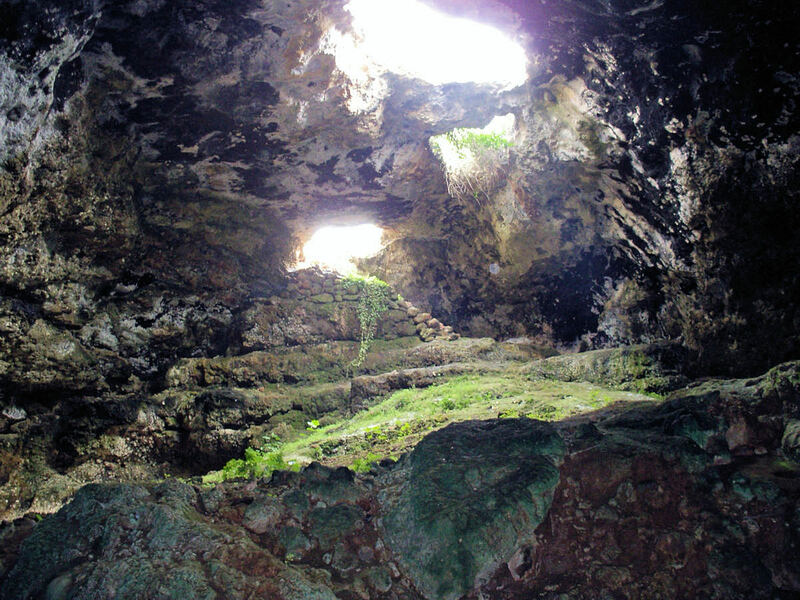 Its roof is the natural rock of the cave. Down the dust track, towards the west, are the ‘Black Caves’. (The track shortly turns left (south), running parallel with the ravine. The caves come into view, high up on the left-hand side. After 150m, the meagre remains of a stone-walled construction are visible in the undergrowth to left: from here a path leads steeply up to the caves.) There are principally two caves. 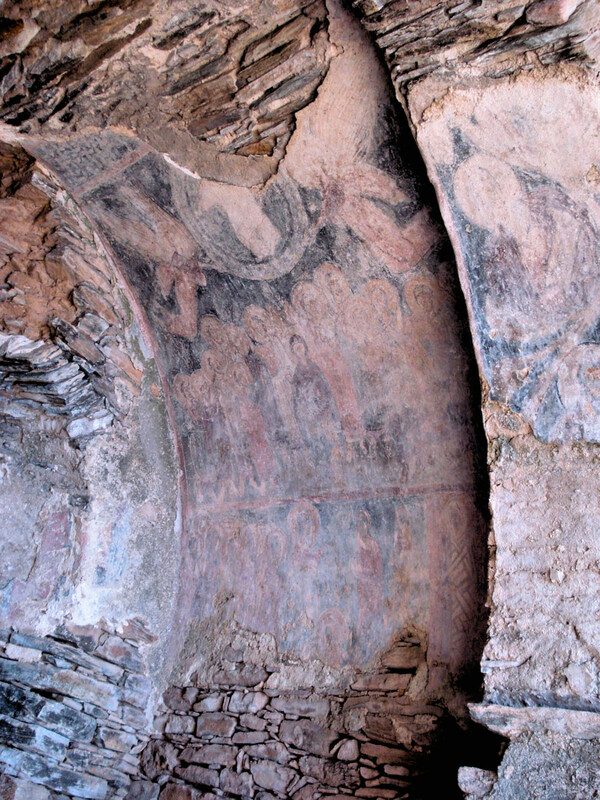 The southern cave incorporates the remains of a Byzantine oratory, with an apsidal cut in the rock and meagre vestiges of wall paintings, bearing a not-fully legible inscription referring to the ‘…Great Martyr, George…’ The northern cave has the remains of mediaeval walling both in its entrance and inside, where the rock has been cut at the north end: the interior once had a spring or pool in it. How ancient these caves are as places of dwelling and refuge is difficult to establish with certainty; but their saintly occupants in the Byzantine era were probably only the latest in a long tradition of worshippers here. South from Fratsia for Aghios Elias. 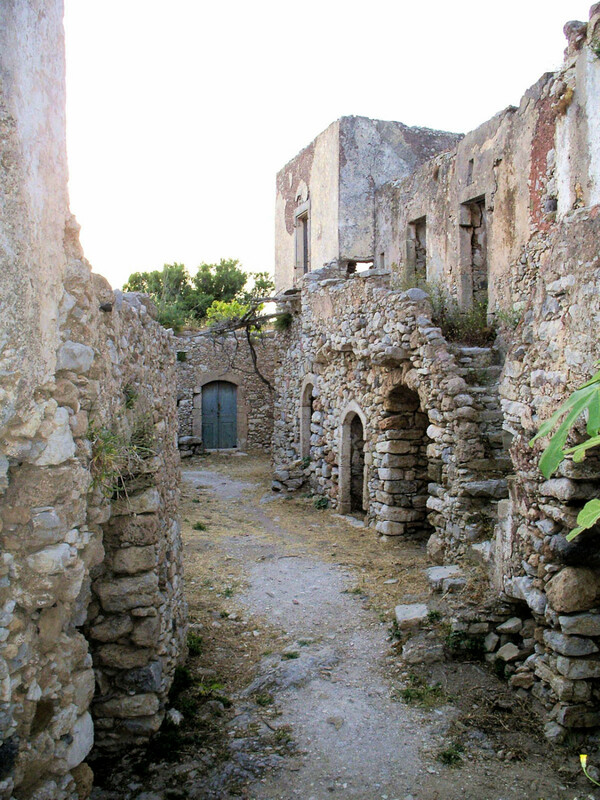 (In village of Aghios Elias, left turn at narrow cross-roads for Palaiopolis and Kalamos, then subsequent left fork (to east) for Palaiopolis. After 1.5km Aghios Demetrios is signposted down track to left.) 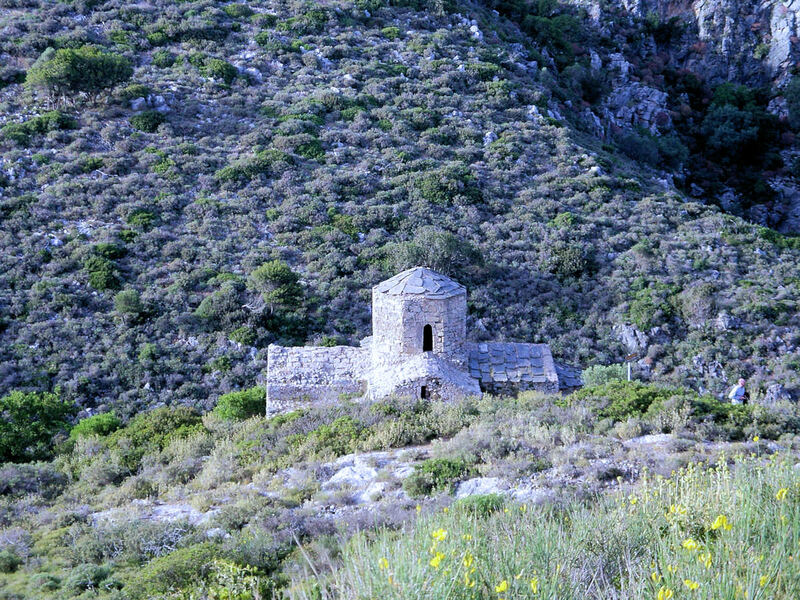 The early 13th century church of *Aghios Demetrios lies in open country, isolated and with fine views down the gorge towards Palaiopolis. The presence of substantial ruined buildings nearby, suggest that this church was once the catholicon of an imposing monastery. The church to day is a simple cube with an attached apse, surmounted by a cupola—the dome occupying almost the whole of the area of the naos. The interior is dominated by the huge and impressive, early 13th century depiction of a youthful and finely robed St Demetrius with both hands raised in prayer, flanked by Two Donors—a man (in black clothes) and a woman (in extravagant finery), both apparently wearing plain white hats on their heads: these hats were probably decorated originally with applique decorative elements which have since been removed. The fine murals of the dome and on the walls belong to subsequent campaigns of painting, of the late 13th and 14th centuries. 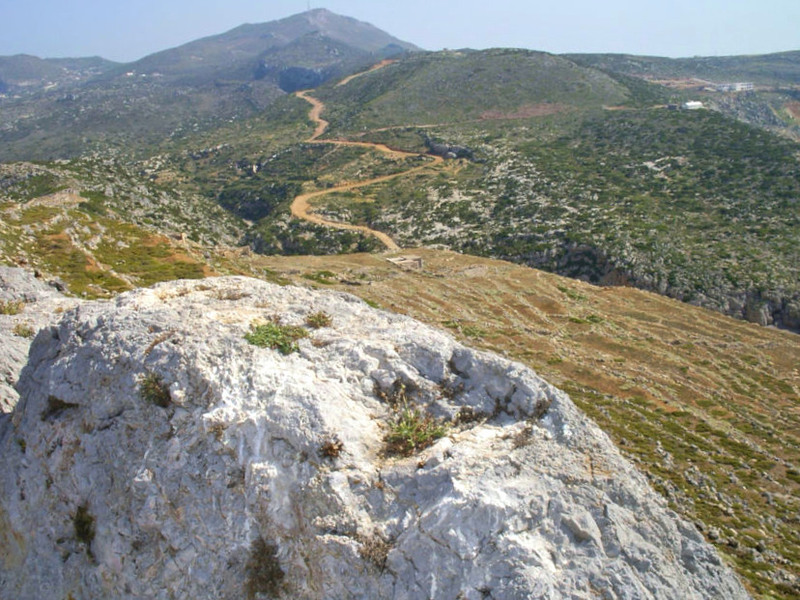 Retracing the route back to the junction and continuing south to Kalamos, the road continues through a number of villages, all bearing names with the character istic, Kytheran ‘-ianika’ ending—Goudianika, Travasar ianika, Skoulianika etc. (In most cases, these names are formed by adding the suffix ‘-ianika’ to the name of the founding family of the village; most of these families were encouraged by the Venetians to stay and re-settle the ravaged island after the depredations of Barbarossa in 1537.) Shortly after, the road crosses a narrow gorge at Katouni on a stately arched stone viaduct, looking un cannily like something you might expect to find in the Tweed Valley. Simultaneously functional and beautiful, the 13-arch span of the bridge was built in 1828/9 by the Scottish engineer John MacPhail, as part of a network of communications lines and improvements planned under the British administration to give the Ionian islands the infrastructure necessary for economic growth. The extant lighthouses and school-buildings on Kythera were also part of this overall plan. A short distance beyond the bridge, the road comes to a wide junction with the church of the Analipsis (Ascension) on the left, in the settlement of Kato Livadi. 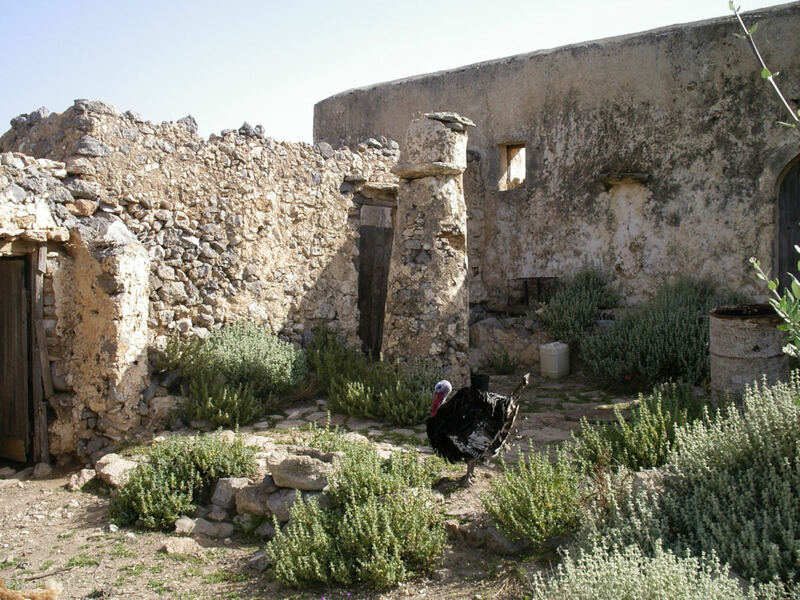 The small building on the north side of the church houses the island’s collection of Byzantine and post-Byzantine art. (Open 8.30–2.30; closed Mon.) This is a small collection of icons, ecclesiastical objects, and detached wall-paintings (from many of the churches mentioned in this text), beautifully displayed and clearly illuminated. The collection rotates, so it is not possible to predict exactly what will be on show. But customarily exhibited are: the apsidal painting of St Andrew from Aghios Andreas, Livadi (13th century); a group of standing Saints from Aghios Ioannis in Potamos (13th century); St Nicholas from Aghios Petros, Arei (13th century); St Catherine from Aghios Antonios in Palaiochora (16th century). Here also is the important fragment of early Christian floor mosaic from Aghios Ioannis in Potamos, and a number of beautiful 17th century icons, amongst which is a fine St John the Baptist, showing Cretan influence. Detaching a fresco or wall-painting is a traumatic business for an ancient work of art: it involves adhering a linen cloth with a slow drying soluble glue to its painted surface. This holds the pictorial layer complete and integral while the plaster on which it is painted is physically sliced away from an older layer of plaster or from the wall behind it. Once free of its support, the painted surface, now held and bound temporarily by the cloth, is transferred to a new wall or panel (in this case, one suitable for museum dis play). A solvent is then applied to the cloth to release the glue’s adhesion to the paint surface, which is now again held integrally by its new support. 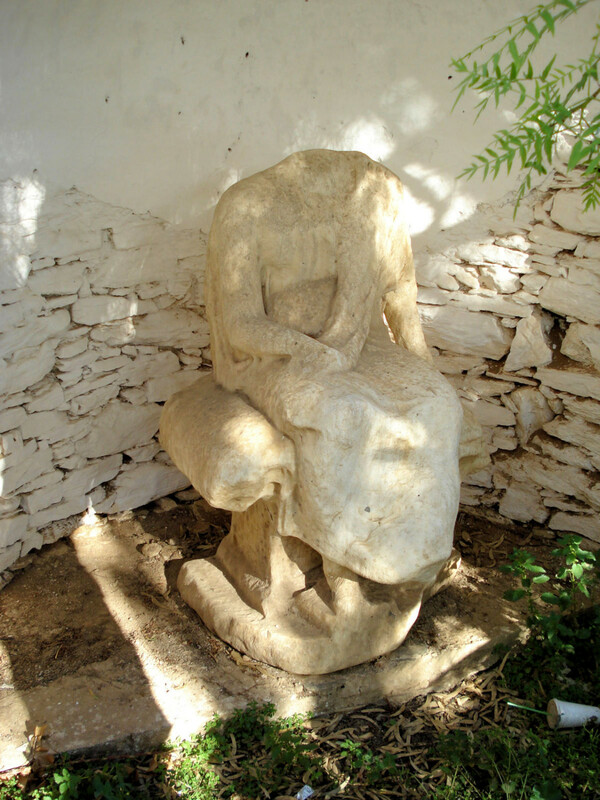 The process is best avoided if at all possible, but it may be necessary in two kinds of situation: if the painting is in danger because of imminent structural collapse of its sup porting wall or from exposure to weather or chronic infiltration of water (as is the case with the paintings taken from Palaiochora); or if it is felt necessary to reveal a lower, older layer of painting beneath by removal of the covering layer (as in the case of some of the paintings here from Aghios Andreas, Livadi). Four kilometres south from the junction at the church of the Analipsis, the road comes to Kalamos, after passing an impressive stand of cypress trees in the valley below. Here, as in Mitata, there is good local honey for sale. From Kalamos a sign-posted road leads east down to the coast at Fyri Ammos, a long and beautiful, but exposed, stretch of beach. By the (second) road junction, 2.8km from Kalamos and 2km inland from the beach, a path leads south to the minute and hidden 14th century church of Aghios Myron. The church is built on a steep gradient and the whole south side consists of one huge sloping buttress, as if to stop the building sliding down the hillside. 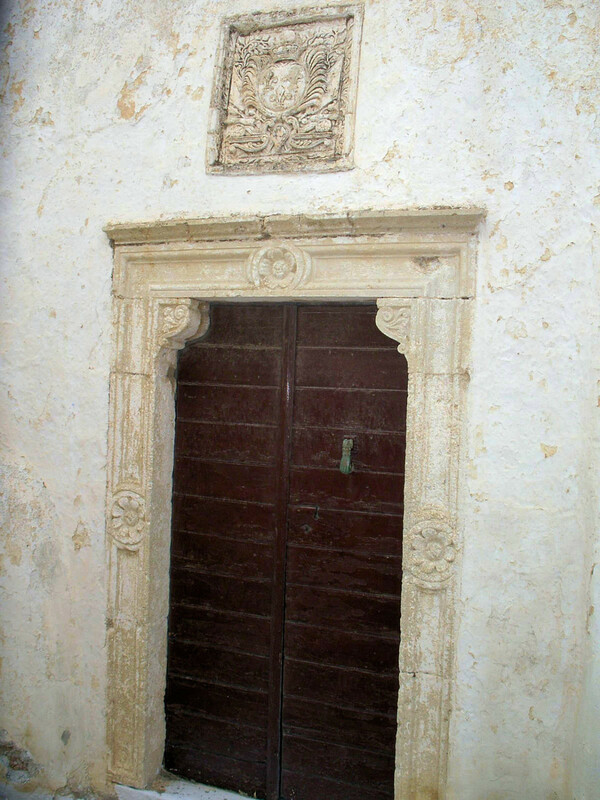 The tiny dark interior measures about 4 x 2.5m, traversed by a partially painted templon screen in masonry. The best-pre served paintings, dating from not long after the church’s construction, are the figures of saints on the lateral walls. 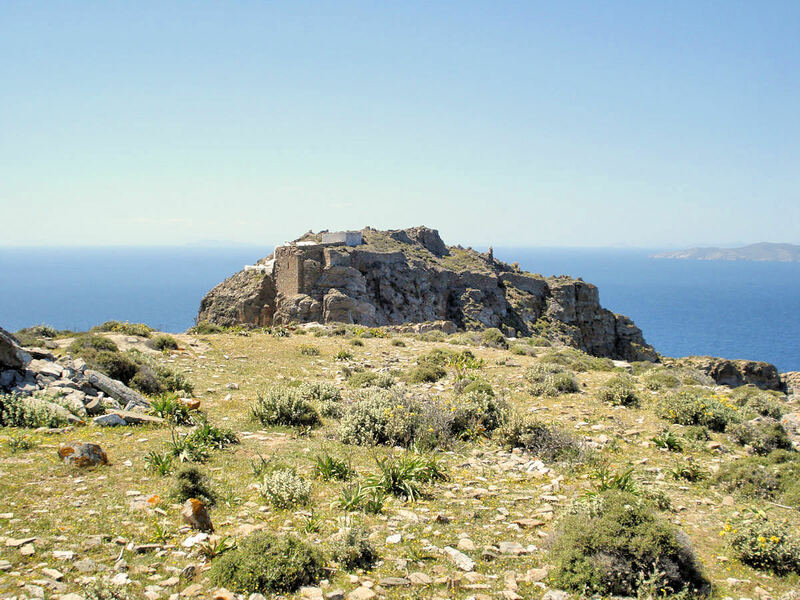 The track which heads due north from the junction at this point leads to the isolated and panoramic church of Aghios Ioannis Theologos. This is an interesting exam ple of a church whose cupola, surrounded by a tall ‘collar’ of masonry, also serves as a watch-tower. 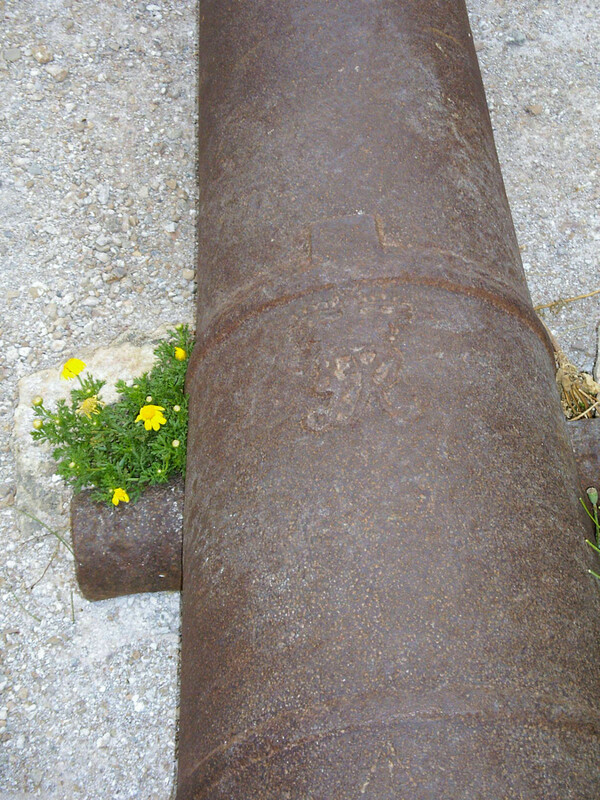 This is the best preserved example of a phenomenon called a ‘vardiola’ which was relatively common on the island and served to keep a look-out against the constant danger of pirates. From Kalamos, the main road leads back west to Kapsali and Chora, along a high ridge with views to the south. 1.2km west of Kalamos, a road off to the south descends steeply through cypress and olive groves into a ravine, and brings you (1.8km) to the impressive cave of Aghia Sophia of Spilies. The cave, with a modern chapel in its entrance, is wide and has some venerable stalactites and stalagmites in its depths. 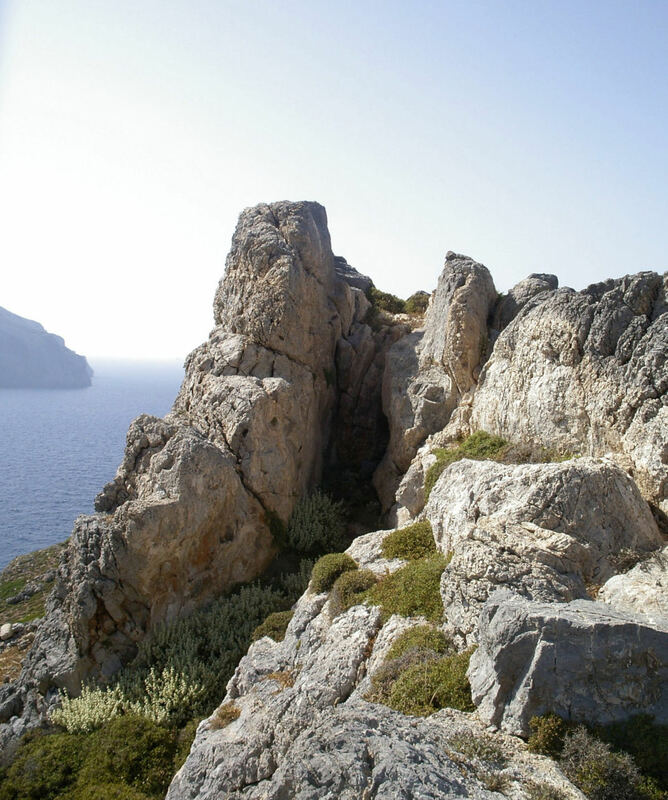 It is not surprising that this numinous spot has yielded evidence of the earliest human settlement on the island in the form of pottery datable to around 5500 bc. There is almost unbroken continuity of human presence here up into the late Bronze Age. Just over three kilometres (by track) beyond Aghia Sophia to the south is the pretty and protected beach of Halkos; further still to the east, and accessible by 4km of track from Kalamos, is the beach and cove of Vroulea. Returning to the main asphalt road above Aghia Sophia, however, and turning west will bring you to Kapsali and to Chora after 4.5km. Olympic Air runs one daily flight between the island and Athens throughout the year. 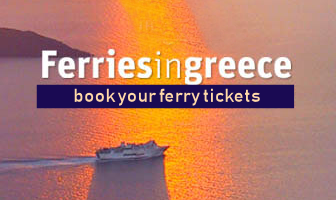 Otherwise access is by sea from the southern Peloponnesian ports of Neapolis (one mid-morning ferry daily, making the journey in 1hr: T. 27340 22660 & 24004); Gytheion (four sailings per week—3 hrs: T. 27330 22207); and, more occasionally, in summer from Kalamata (5 hrs). These last two routes continue on to Kisamos (T.28210 28217 & 24147) in eastern Crete, from which there is the same frequency of return connections. 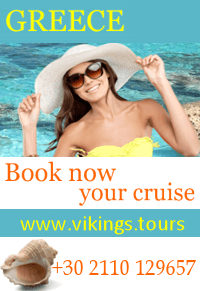 There are also weekly connections with Piraeus by ferry all through the year, and by hydrofoil in the summer months. 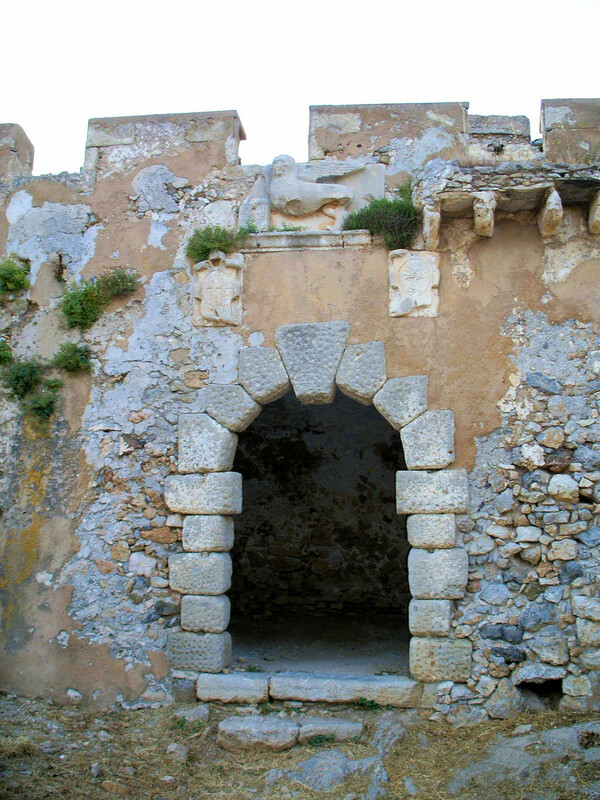 port of Diakofti on the east coast of the island, 31km from the island’s capital, Kythera Chora. 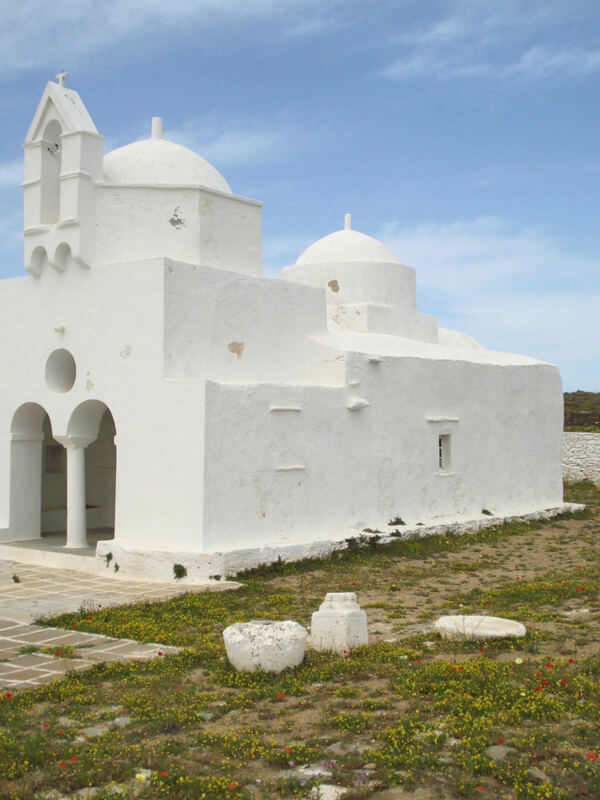 Rooms for rent can be found in many of the villages on the island: the hotels, however, are mainly concentrated in or near Kythera Chora and at the port of Kapsali below. 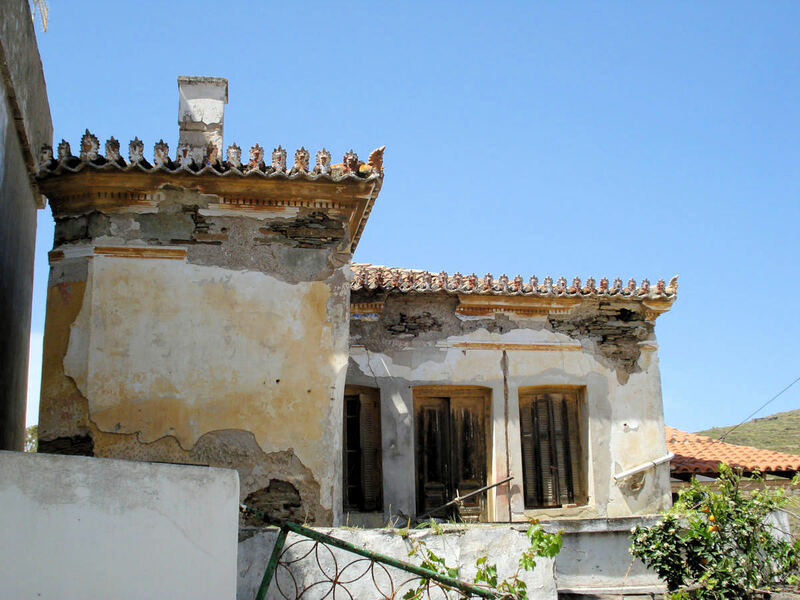 Particularly peaceful and with a good and panoramic terrace for breakfast, is the Hotel Margarita just off the main street in Chora, in the 19th century house in which Valerios Staïs, the archaeologist, was born. Open all through the year. (T. 27360 31711, fax 31325, www.kythira margarita.com). 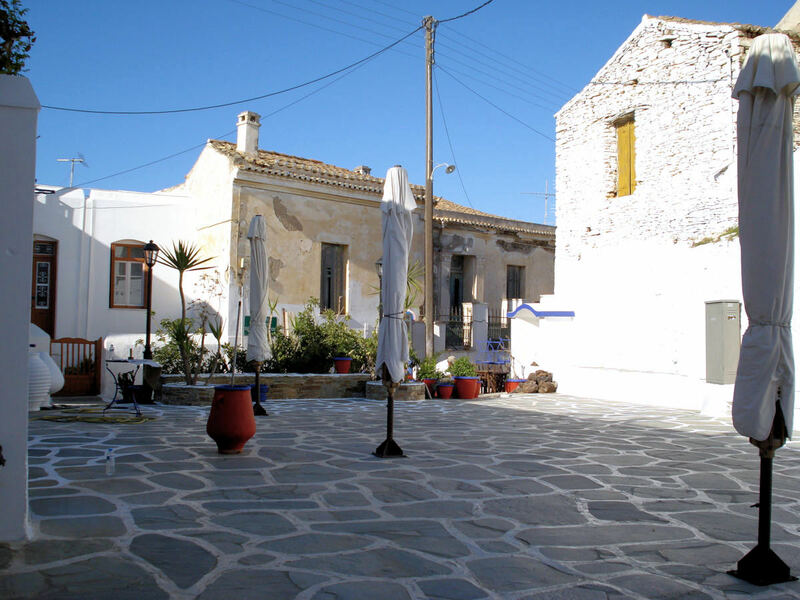 Nearby, at the entrance to the Kastro of Chora is the small Pension Nostos, with half a dozen select, simple, well-appointed rooms of great charm (T. 27360 31056, fax 31834, www.nostos-kythera.gr). In Chora it is not easy to find both good food and a pleas ant setting together. O Salonikos, on the main road, has commendably fresh dishes at reasonable prices; but both places slightly lack atmosphere. 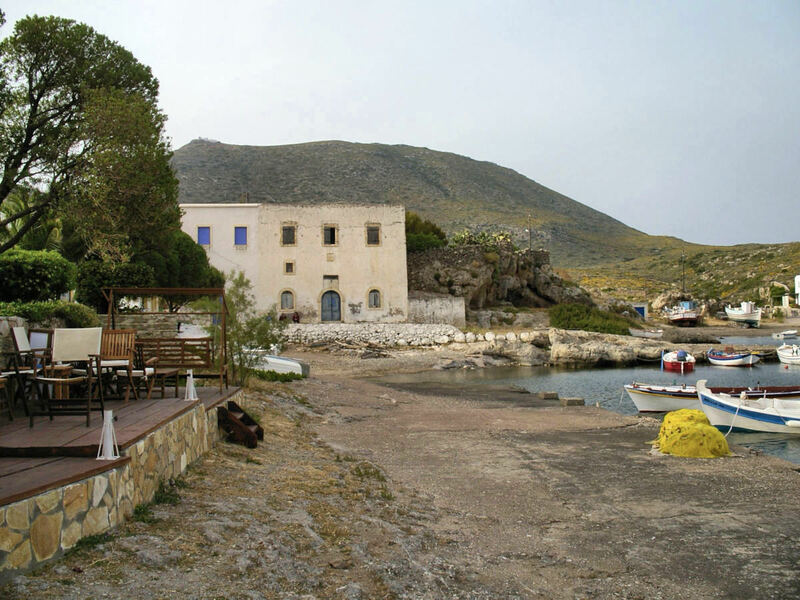 One of the best tavernas to eat at on the island is Skandeia at Palaiopolis: it has excellent fresh wine, freshly-caught fish, and a variety of home-made, vegetable pittakia; the owners are welcoming and the setting is shady and beautiful. At nearby Avlemonas, Korali also has good fish. Kapsali has a number of adequate tavernas, of which O Magos is perhaps the best. For Kytheran honey, Yiannis Protopsaltis at Mitata is recommended. Port Authority: T. 27360 34222 (Diakofti), 33280 (Aghia Pelagia).